Here’s anoth er batch of mini-reviews of the various comics I’ve been trying out recently. Much like Matt Fraction’s Hawkeye, this is the story of what Black Widow gets up to when she’d not being an Avenger. Generally, she’s doing less than legal things in order to help make money to (somewhat) atone for her sins towards her previous targets families. This is a beautiful book and Natasha is awesome and I really like her relationship with her lawyer, who is also quietly badass. I love how Natasha does sometimes make mistakes (because she’s only human) and does get hurt but that doesn’t mean she stops fighting and being an awesome spy. 5/5. Saga is a sci-fi, fantasy epic with star-crossed lovers. Alana and Marko fall in love and have a child, the only problem is that they are from long-warring alien races. Their marriage and child are against both races laws and they must fight for their survival while trying to bring up their daughter Hazel. I liked Alana a lot since she was no nonsense and tough (even when giving birth) but you can still see her softer side in relation to Marko and Hazel. Also I loved the artwork and how the aliens really look alien. Some are more humanoid than others but some of the best are the ones that look so weird and different – Prince Robot IV is kind of awesome since he has a human body but then a TV as a head. 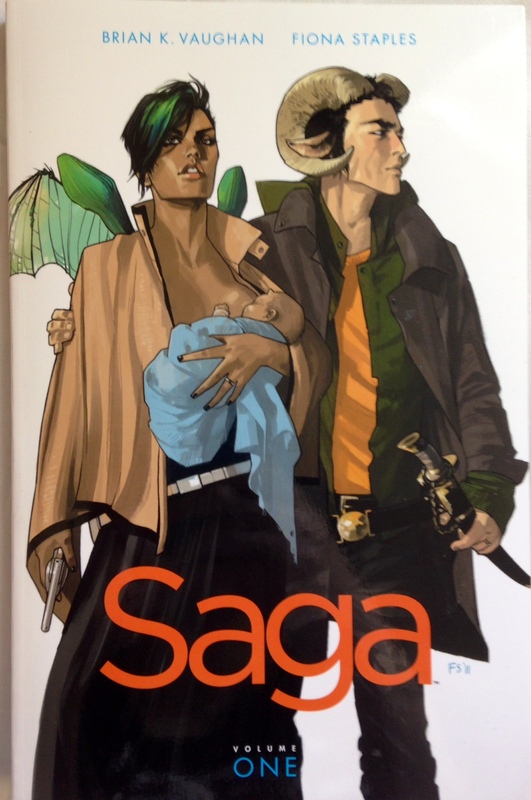 Saga is action-packed and funny and a great bit of epic science-fiction. 5/5.